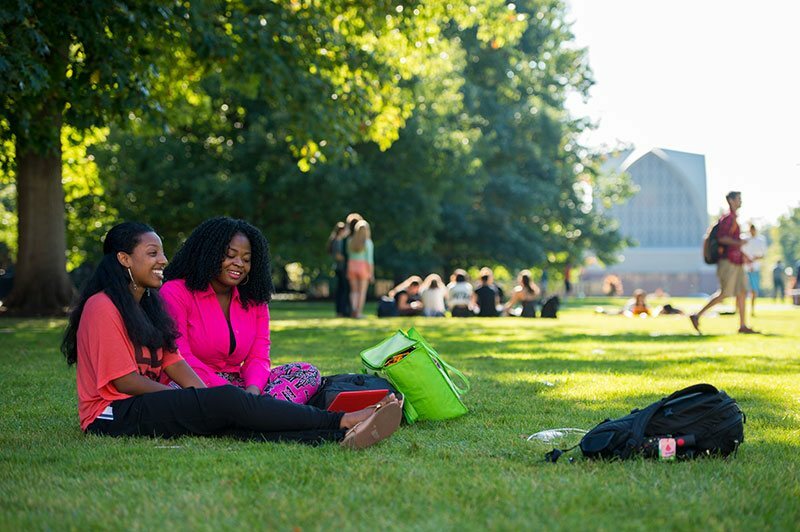 We hope you’ll find this page helpful in learning more about the University of Rochester and the students who thrive here. Whether you’re interested in our counselor fly-in programs, request a virtual info session, or learned what we award AP credit for, or what scholarships we offer, you’ll find it here. Accelerating our progress as an international leader in sciences, engineering, social sciences, health science, business, and music. Empowering our students to fulfill their academic and professional passions in a University that is diverse, welcoming, and inclusive for all students, faculty, and staff. Creating innovative connections among education, humanities, music, the social sciences, science, engineering, and health science. Strengthening support for a dynamic faculty dedicated to teaching, mentoring, research, clinical care, and the creative and performing arts. Serving our community of alumni and friends through imaginative programs that enrich their lifelong relationship with the University and that expand our collective contributions to the world. Embracing our leadership position in Rochester and the nation by making our community a model for partnership among academic, civic, cultural, health care, and business organizations. In reviewing applications, Rochester counselors take a variety of factors (most notably, the ones below) into consideration for a holistic review process. One factor that carries the most weight in reviewing applications is the high school transcript. Honors, AP, and IB classes are strong indicators of the extent to which students challenge themselves. However, we understand that course offerings vary greatly from one school to another. Please encourage your students to visit campus. This type of contact is important to us, as we keep track of all demonstrated interest. We want to be sure the students we admit know the University well and truly want to be here. If visiting is not an option, there are events, information sessions, and interviews hosted around the world from September to December. Offered to rising seniors around the world, our admissions counselors and far-reaching alumni base area host admissions interviews. While not required—but strongly recommended—an interview is a great way to show demonstrated interest. Interviews allow students to tell us more about themselves. Interviews also help determine scholarship candidates and give each student the opportunity to talk one-on-one with someone who knows the University well. From September to December we offer on- and off-campus interviews; however, if meeting one-on-one is not possible, we also offer interviews over Skype and the phone. Students apply to the University, not any specific major. As a result, all students (including engineers!) are accepted as “undecided” and are not required to officially declare a major until the end of their sophomore year. Ranked in the top 10% of their high school class. Taken 2–7 AP or IB courses. Maintained a median academic unweighted GPA of 3.8. Submitted an SAT score between 1900 and 2200 or an ACT score between 29 and 33. These are only the bare numbers to describe a Rochester student. We also value unquantifiable strengths such as initiative, creativity, enthusiasm, and leadership, and we’re also careful to ensure each class represents the full spectrum of diversity, including hometowns, ideas, and experiences. Join us during Western New York’s spectacular fall season as we guide you through the region to visit some of the state’s finest colleges and universities. The tour includes stops at Nazareth College, Rochester Institute of Technology, St. John Fisher College, and the University of Rochester. An opportunity to visit Rochester in the spring along with several other Upstate NY colleges and universities including Union College, Rensselaer Polytechnic Institute, Syracuse University, Ithaca College, Rochester Institute of Technology, and the University of Rochester. The University of Rochester’s annual Secondary School Issues Conference is a professional conference where you will hear thought-provoking speakers and express your views on issues related to secondary school education and college counseling. More than merely a college visit, this event is aimed at looking at the bigger picture. An opportunity to visit Rochester in the summer along with several other Upstate NY colleges and universities including Syracuse University, Ithaca College, Rochester Institute of Technology, Colgate University, Hamilton College, Union College, Rensselaer Polytechnic Institute, Skidmore College, and the University of Rochester. With a permanently endowed fund, the Alan and Jane Handler Scholarship is awarded to selected students who do not otherwise have the financial means to attain a Rochester education. Scholars are selected on the basis of academic excellence, outstanding potential to be future leaders, and demonstrated mastery of complex challenges. The Handler Scholarship is the University’s leading award. Handler students will receive assured, complete financial support (tuition, fees, room, board, books, personal expenses and transportation), as well as individual and group opportunities, for the duration of the regular four-year academic program. Each year, participating high schools may nominate up to four qualified students, one for each of these awards. All nominees will have their application fee waived and will be eligible to be considered for merit scholarships worth at least $10,000 per year. We’re visiting over 400 high schools in your area to share more information about Rochester. Find an off-campus event near you. If we aren’t traveling to you, virtual information sessions are a great way to learn more about Rochester, connect with current students, or hear from our admissions counselors about general tips for the admissions process. What do I need for a virtual information session?